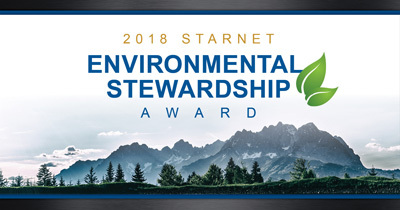 Starnet® Commercial Flooring, the world’s largest network of full-service independent flooring contractors, today announced the winners of the annual Starnet Environmental Stewardship Awards. These Environmental Champions were announced at the 2018 Starnet Annual Membership Meeting in Orlando, FL on April 20. Annually, the Starnet Environmental Issues Committee celebrates members who are leading the way with the Environmental Stewardship Awards. “These programs are a foundation to create a greater awareness of environmental initiatives while also rewarding the collective efforts of local teams,” said Carlton Billingsley, Chairman of the Starnet Environmental Stewardship Committee. The committee’s mission is to promote environmental stewardship via the development and implementation of environmentally responsible processes and educational programs for the Membership and their clients. The committee sponsors the awards to collect best practices being implemented by members in their local communities. Philip Ivey, a guest judge from Starnet Preferred Vendor, Milliken, presented the awards during the meeting. “It is so inspiring to see the commitment of these businesses as they explore and implement new programs to run a more sustainable business,” said Ivey. “We can all learn from their best practices and hopefully achieve higher standards in our own businesses.” Ivey was joined on the judging panel by Kemp Harr, Floor Focus, Publisher and Owner, and Robert Peoples, PH.D., Executive Director, Carpet America Recovery Effort. 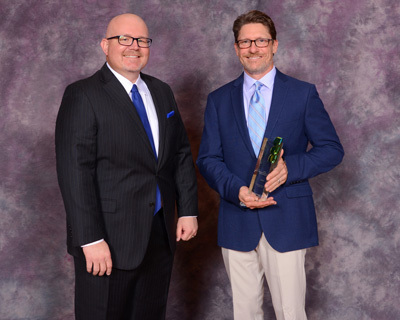 The Gold Award went to Corporate Floors (Texas) for their comprehensive energy management system and recycling efforts. The company uses fuel saver vehicles, and recycles all paper, plastic and even maintenance chemistry containers. In addition, they have installed a comprehensive energy management system in its 32,000-square-foot headquarters which manages lights, HVAC and overall electrical usage, resulting in substantial electrical savings. They use eco-friendly installation products and have a zero carpet-and-recyclable-materials-to-landfill policy. Importantly, all of their efforts are tracked. Each year Corporate Floors donates several trailer loads of flooring, both new and used, to Habitat for Humanity, for reuse. For the last several years, Corporate Floors and Texas Carpet Recycling have been the title sponsor of the Zero Landfill program. CF and TCR donates their trucks, warehouse and labor to pick up, sort and manage the overall Zero Landfill logistical needs. Thomas Holland is a member of the State of Texas Alliance for Recycling, the North Texas Green Building Council and a former Board Member of CARE. Corporate Floors provides the Innovations in Carpet Recycling CEU course to design and architect firms, along with consulting and guidance on the correct ways to recycle post-construction debris. Through its company Texas Carpet Recycling, one of the leading commercial carpet recycling companies in the U.S., it diverts materials such as fiberglass, VCT, carpet, ceiling tile and other post construction debris from landfills. 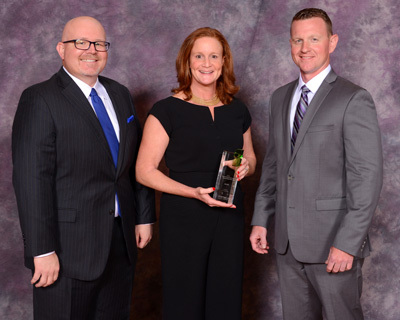 The Silver Award was presented to CI Select for their employee-led program to evaluate and establish a comprehensive program focused on sustainability, the environment, and health & wellness. The program is broad, providing guidelines to reduce waste and increase access to water, keeping employees hydrated; eliminating Styrofoam and disposable dishes from the kitchen; and implementing a no-idling policy at the warehouse docks, providing a healthier air quality. New guidelines for Sustainable Events will allow for composting and recycling, while also providing guidance on using caterers who grow and source products locally and package food minimally. CI Select employs Missouri’s first WELL Accredited Professional, now a WELL Faculty member able to teach the standard. She is a member of the U.S. Green Building Council, Gateway Chapter, and through that relationship, CI Select hosted two [CEUs] in 2017 for the [USGBC]. It is her involvement with WELL, and through the USGBC, that CI Select can align the environmental goals of the Green Team with health and wellness goals. 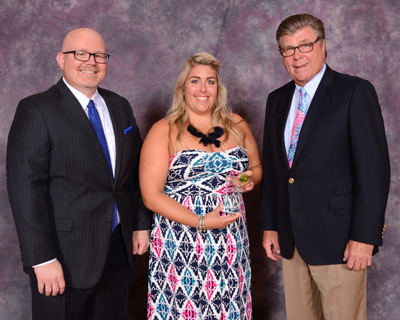 The 2018 Bronze Award winner was Allegheny Contract Flooring, headquartered in Winchester, Mass. Allegheny Contract Flooring has a full program of recycling and reclaiming, recycling 36 trailers filled with pallets, plastic, cardboard, flooring, installation and packing materials each year. Using eco-friendly installation products, they also have a zero waste-to-landfill policy – they have recycled an astounding 10 million-plus pounds of broadloom and carpet tile by donating restored and reusable product to nonprofit organizations or recycling for re-use in manufacturing or products such as park benches, automobile accessories and curb blocks. None of the broadloom or carpet tile is disposed of in landfills or burned in incinerators, following the Carpet America Recovery Effort (CARE) standards. A group of employees work with local reps, architects and designers at The Food Project, teaching at-risk young people about health, leadership, charity and sustainable agriculture – building healthy communities. They have also done similar work with City Year and other local non-profits and charitable fundraisers. Their Office of Sustainability is dedicated to ongoing research into green building, sharing knowledge and expertise with customers. They are long-standing members of the U.S. Green Building Council, and are one of the few flooring contractors in the country with a LEED Accredited Professional on staff.